An excellent presentation-conversation about the need for cooperation between the public and the private sector for a smart, effective and efficient state. 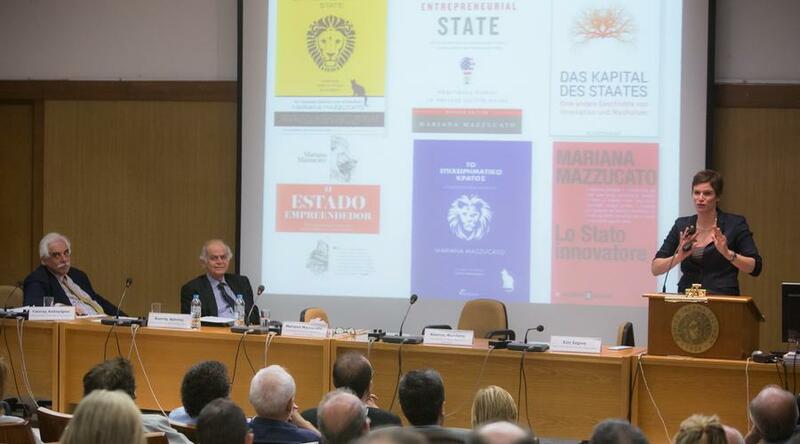 Professor M. Mazzucato launched the Greek edition of her book “The Entrepreneurial State- debunking public vs. private sector myths”, published by Kritiki editions, at a standing room only event at the National Hellenic Research Foundation in Athens, on Thursday 19 May, 2016. The event which was organized by the National Documentation Centre and Kritiki editions began with a speech on the relevance of the book for Greece’s economy by the Greek Minister for Research & Innovation, Costas Fotakis. Other speakers discussing the book included Dr Evi Sahini (Director of the National Documentation Centre), Kostis Vaitsos (Emeritus Professor of the University of Athens) and Yannis Caloghirou (Professor at the National Technical University). M. Mazzucato held the attention of over 250 attendants focusing on how interesting and dynamic synergies could be created between the State and the enterprises, especially where innovation and green technology are concerned. She also expounded on the role of the state that doesn’t only fix market failures, but also actively shapes and creates markets, by making the high risk investments, referring to the 3 big battles of the state: smart growth (more innovation), sustainable growth (more green) and inclusive growth (less inequality). Mariana’s Mazzucato book is a reference point for the global debate about the relationship of the state with innovation and entrepreneurship and has already been translated in 8 languages including Greek.